Compostable tableware’s products are used for serving food. These products are biodegradable and release valuable nutrients into the soil, aiding the growth of trees and plants when they breakdown. Compostable plates can be placed into the compost bin after use. These products degrade within several months in an industrial composting facility and produce no toxic residues. These plates are reusable and are made up of renewable resources. These renewable sources are made from all-natural materials such as agricultural residues, palm leaves, bagasse, bamboo, and cornstarch-based PLA plastic. These eco-friendly tableware’s are sturdy enough to hold hot or cold food and easily gets biodegraded after use. Compostable plates and bowls are the perfect solutions for emerging green businesses. The growing awareness about the adverse effects of plastic such as massive plastic pollution and its grave consequences on aquatic and aerial creatures after dumping this product into the sea are the major driving factors for the growth of compostable tableware market. The increasing demand for safe, sustainable and environmental friendly cutlery owing to the rising number of fast food restaurants and cafeterias is boosting the compostable tableware market. Compostable disposables are a viable alternative that provides the convenience of disposable plates when used in catering for parties, picnics or other occasions along with an added advantage of no negative impact to the eco-system. However, the lack of awareness about the benefits of compostable tableware’s and the poor management of organic waste hampers the growth of compostable tableware market. The cost of compostable tableware is also higher as compared to the traditional disposables. Moreover, the rising enforcement of environmental laws and the growing need for better waste management is anticipated to create an opportunity for the growth of compostable tableware market. According to the geographies, Asia Pacific dominates the compostable tableware market owing to the growth of the compostable tableware producing companies in this region. In addition, the governmental initiatives to promote the usage of environment-friendly products are also anticipated to boost the growth of the compostable tableware market in the Asia-Pacific region. Europe is also one of the fastest growing regions, owing to the huge investments in research and development by private as well as government sectors in the development of compostable tableware market. The report on global compostable tableware market covers segments such as type and end-user. On the basis of type, the global compostable tableware market is categorized into bowl and lids, cups and lids, portion cups and lids, containers and lids, plates, reusable dishware, straw and cup sleeves, compostable spoons, and others. On the basis of end-user, the global compostable tableware market is categorized into household, food joints & takeaways, hotels, and others. The report provides regional analysis covering geographies such as North America, Europe, Asia-Pacific, and Rest of the World. In this section, the key trends and market size for each geography are provided over the period of 2016-2024. The countries covered in the North America region include the U.S., Canada, and Mexico; while the Asia-Pacific region includes countries such as China, Japan, India, South Korea, Malaysia, and among others. Moreover, Germany, U.K., France, Spain, and Rest of Europe are the major markets included in the European region. The U.S. drives the growth in the North America region, as it is the largest market in the region. In the Asia-pacific region, rapid industrial growth in India and China offer a substantial potential for the growth in the compostable tableware market. As a result, the APAC region is projected to experience a growth at a CAGR of x.x% over the forecast period 2018-2024. 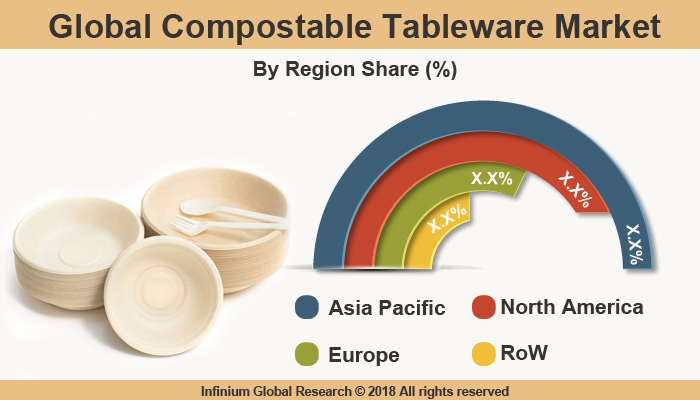 The report provides profiles of the companies in the global compostable tableware market such as Ecoware, Stalk Market, Vegware Limited, Chuk, PAPPCO Greenware, BIOTREM, and Minima. The report provides deep insights into the demand forecasts, market trends, and micro and macro indicators. In addition, this report provides insights into the factors that are driving and restraining the global compostable tableware market. Moreover, The IGR-Growth Matrix analysis given in the report brings an insight into the investment areas that existing or new market players can consider. The report provides insights into the market using analytical tools such as Porter's five forces analysis and DRO analysis of compostable tableware market. Moreover, the study highlights current market trends and provides forecast from 2018-2024. We also have highlighted future trends in the compostable tableware market that will affect the demand during the forecast period. Moreover, the competitive analysis given in each regional market brings an insight into the market share of the leading players. This report will help manufacturers, suppliers, and distributors of the compostable tableware market to understand the present and future trends in this market and formulate their strategies accordingly.